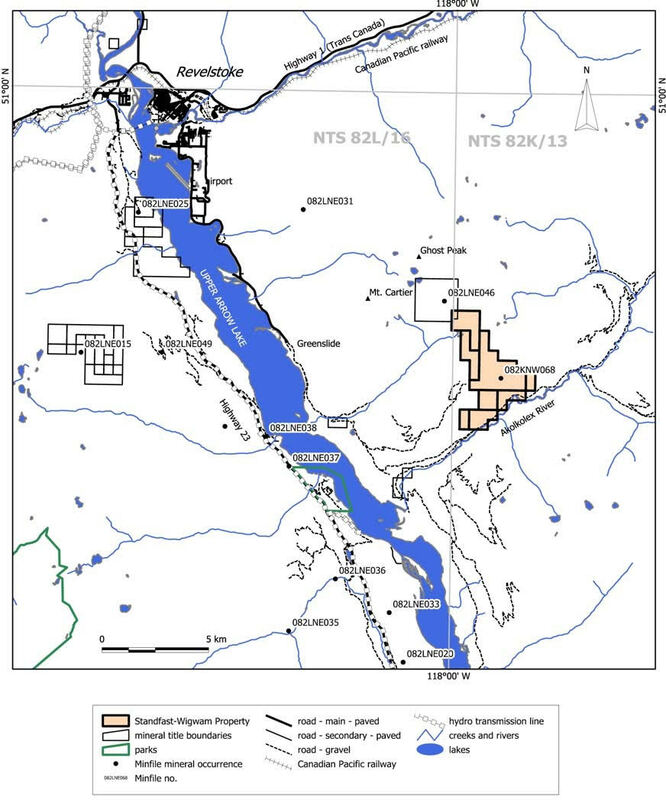 The Standfast Wigwam polymetallic project is located on the western side of the Selkirk Mountains. This area represents the northwestern limit of the Kootenay Arc, a narrow belt of deformed sedimentary and volcanic rocks that is part of the structural - metamorphic transition between the Shuswap Metamorphic Complex to the west and the Selkirk Mountain Fold and Thrust Belt to the east. Several small to medium size Zn-Pb-Ag deposits, some of which have been mined, as well as numerous showings are scattered along the length of the arc. On the Standfast Wigwam property, 34 mineralised zinc-lead showings are reported to occur over a strike length of over 3 kilometres. These showings occur mostly as conformable sulphide rich lenses within fine-grained quartzite and silicified limestone of the Cambrian age Badshot Formation of the Lardeau Group. Mineralisation is contained within the thickened hinge zone of the Drimmie Creek syncline, a large recumbent isoclinal fold. The sulphides are mainly pyrrhotite with lesser pyrite, sphalerite and galena; they occur as disseminations and in lenses up to 60 centimetres thick. In February 2019, assay results received from 29 rock samples included 28.60 grams per tonne (gpt) silver, 17.95 % lead and 11.95% zinc from a 60 centimeter chip sample within the northern area of the Main Zone. Numerous samples returned elevated silver (Ag), lead (Pb) and zinc (Zn) with 11 samples returning greater than 8% combined lead and zinc. Of the 29 rock samples, 25 were chip and grab samples of fine grained quartzite and limestone (silicified), containing visible sulphide mineralization, taken over a 425 metre long northern section. Four chip and grab samples were obtained from a 250 metre long southern section where massive sulphide mineralization, brecciation and silicification were noted. All samples were taken from the Main Zone that has been traced for over three kilometres. These initial rock sample results indicate a northwesterly trending area of interest worthy of continued exploration, with potential for near surface zinc-lead-silver mineralization. 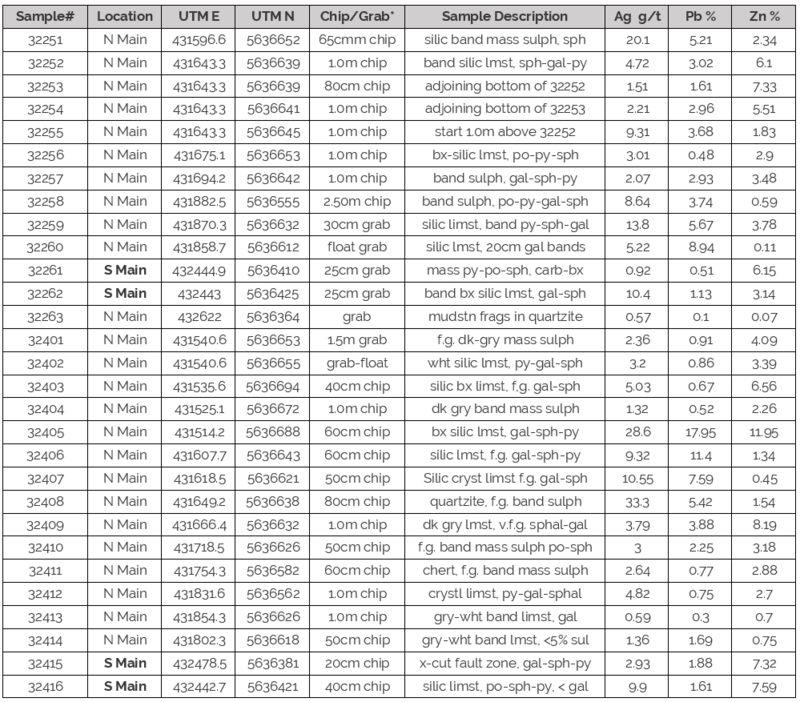 Silver values appear to show a previously unrecognized increase in grade related to silicification (silic) as noted by the samplers. Website Copyright © SPEY Resources Corp. All rights reserved. Website Design by SWAY Creative Group.